Vidyarambha Ceremony for new K.G. 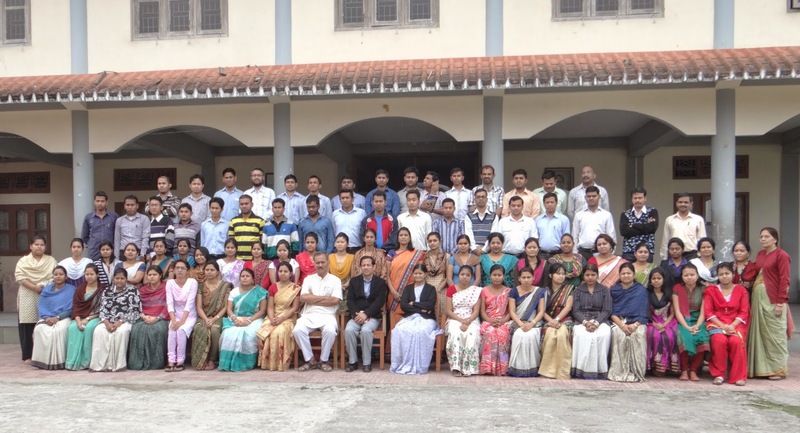 was organized in the Sanskriti Sabagriha of VKV Dibrugarh. The programme started with Mangacharan. The Mangalacharan was followed by the welcome speech by Primary In-charge, Smt. Hironmoyee Das. It was followed by group song from our Padavali. “He Vivekananda Swami” sang by the teahers of our Vidyalaya. The Principal of our Vidyalaya enlightened the parents with the twin objectives of man-making and nation – building envisioned by Swami Vivekananda. He also took the privilege to introduce the history of Rock memorial as Kanyakumari, how it took the present shape and the works done by Vivekananda Kendra throughout the country – its centre, branch and number of educational institutions seen by it. He then highlighted about the significance of Vidyarambha ceremony as well as about parenting. After his valuable and inspiring speech, the ritual of the ceremony began with new K.G. students sitting at the teacher’s lap, chanting “Om” and the child writing “Om” on the rice plate. The little children were given sweets. Parents and their children offered flowers to Bharat Mata with background bhajan accompanying, perfected the ceremony. The programme concluded with Shanti Mantra.